Stars ‘N’ Bars launches a daily Brunch! Launching 27th January Stars ‘N’ Bars will be offering the only daily brunch in the city from 11.30am until 4.00pm. You can now enjoy the specially designed la carte menu with dishes starting from just AED 40, and include a ‘Bottomless Drinks’ package for AED 200. Randolph Hernandez, General Manager for Stars ‘N’ Bars said "A lot of our guest are in the service industry, either working in hotel, restaurants or cafes and can never make a Friday brunch because they are usually working. It made me think back to some spots back home in New York City that served brunch on the weekdays as well. I looked around and noticed that I couldn't find a place in Abu Dhabi where someone can go any day of the week, have good food and throw back some beverages. So, I figured being that we are located in a tourist area and that no one else is doing it, we should be the ones to make it happen. You can expect good brunch plates inspired by famous NYC, New Orleans, and LA spots such as the Croissant French Toast, Huevos Rancheros and Chicken & Waffles. We have some great playlists and entertainment lined up across the week too. Stars ‘N’ Bars is the place you can go anytime and you know you'll have a good time on a dime"
Here at The Capital List we LOVE any new ideas that make the city a little bit more fun. Sounds like we may be taking some extended lunch breaks there soon! Offering a wide range of beverages and traditional American style cuisine options, all set within a relaxed atmosphere with multi-TV screen and video wall to catch all the major sporting events. 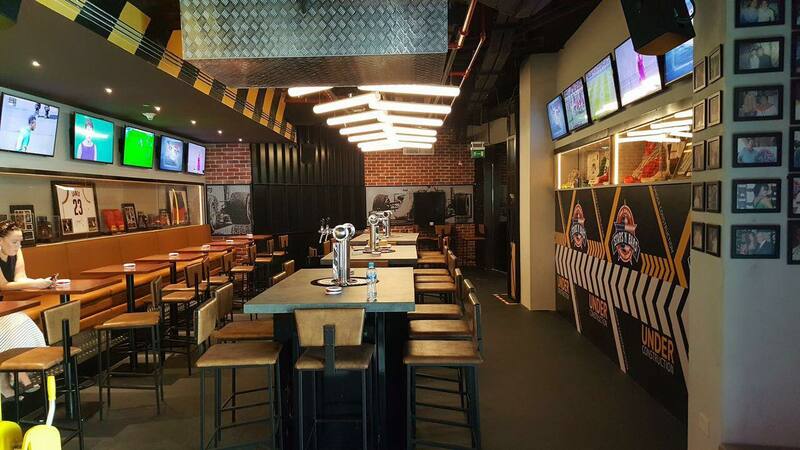 Stars ‘N’ Bars is the American Sports Bar that offers ongoing entertainment for all! From Live Sports coverage, Live music, DJ's, The Lounge and more. Expect the best American style cuisine, happy hour deals every day and unique mixed drinks made by our professional bar team. The newly refurbished outdoor lounge Star Deck features regular weekly events with ‘Trip’ Thursday with The City Vibes, ‘Sunset 2 Twilight’ with DJ Darryl Rees on Fridays, and ‘Etihad Sundays’ where Etihad staff receive 50% off house brews, bubbly & beverages from 9 pm until close.